A week ago today, I had the pleasure of giving a small private paper flower lesson as part of a bachelorette party for a special bride, Diana.This was my first time hosting a private lesson at my studio/condo, but now that I’ve done it once, I can imagine doing more of these private lessons for bridal showers or Mother’s Day too. Diana and I had previously spoken about incorporating paper flowers into her wedding. A few months ago, she and her fiance, Kenny, had visited my small studio space/condo where she had an opportunity to see examples of my work. From our discussion, I knew that her favourite paper flower was the cream/pink closed bloom ranunculus that I had made with fine crepe paper as it fit perfectly into her wedding colours of mint and pink. As a result, when her Maid of Honour approached me about a private lesson for the bridal party for Diana’s bachelorette, I knew exactly which paper flower to teach. Diana had no idea of what she would be doing at the bachelorette, so it was a nice surprise for her when I opened my door for her and her party. We were going to have a paper flower workshop bachelorette party! Good thing she was crafty! 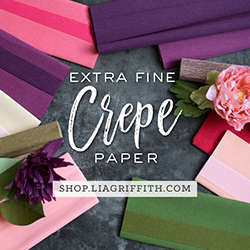 We used 180 gram crepe paper instead of the fine crepe (you can now purchase the 180 gram crepe paper AND fine crepe paper from The Paper Place), as I find that the heavier florist crepe is way easier to work with, especially for beginners. We worked with templates and a pre-glued styrofoam ball. After 2.5 hours, each student was able to complete one ranunculus. Along with my pre-made ranunculuses, I put together a small bouquet for Diana with a dusty rose ribbon so she could parade around town with it. I should also point out although I only taught the closed bloom ranunculus I had 2 blooming ranunculuses (the somewhat flatter-looking flowers) on display as well.